WASHINGTON (AP) The latest GOP effort to repeal and replace “Obamacare” was fatally wounded in the Senate Monday night when two more Republican senators announced their opposition to the legislation strongly backed by President Donald Trump. Trump, who had predicted success for the legislation just hours earlier, responded with a tweet urging: “Republicans should just REPEAL failing ObamaCare now & work on a new Healthcare Plan that will start from a clean slate. Dems will join in!” But Republican leaders rejected that clean-repeal approach months ago because it could not pass Congress. Trump had kept his distance from the Senate process, but Monday night’s development was a major blow for him, too, as the president failed to rally support for what has been the GOP’s trademark issue for seven years – ever since Obama and the Democrats passed the Affordable Care Act. Republicans won the White House and full control of Congress in large part on the basis of their promises to repeal and replace “Obamacare,” but have struggled to overcome their deep internal divisions and deliver. The Senate bill, like an earlier version that barely passed the House, eliminated mandates and taxes under Obamacare, and unraveled an expansion of the Medicaid health care program for the poor and disabled. But for conservatives like Lee and Paul it didn’t go far enough in delivering on Republican Party promises to undo Obama’s law, while moderates like Collins viewed the bill as too extreme in yanking insurance coverage from millions. McConnell’s latest version aimed to satisfy both camps, by incorporating language by Sen. Ted Cruz of Texas allowing insurers to sell skimpy plans alongside more robust ones, and by adding billions to treat opioid addiction and to defray consumer costs. His efforts did not achieve the intended result. There was no immediate reaction from McConnell’s office. But Democrats could barely contain their glee. There are at least a half-dozen or so others who are undecided, so it’s quite likely that more “no” votes will be announced in the hours and days ahead. In a Senate divided 52-48 between Republicans and Democrats, McConnell could lose only two senators and still prevail on a procedural vote to open debate on the bill. He had hoped to hold that vote this week, but Sen. John McCain’s recovery following surgery in Arizona had already pushed back that timeframe. Earlier this month, Moran faced tough questions from constituents at a town hall in tiny Palco, Kansas, about the impact of the GOP bill. 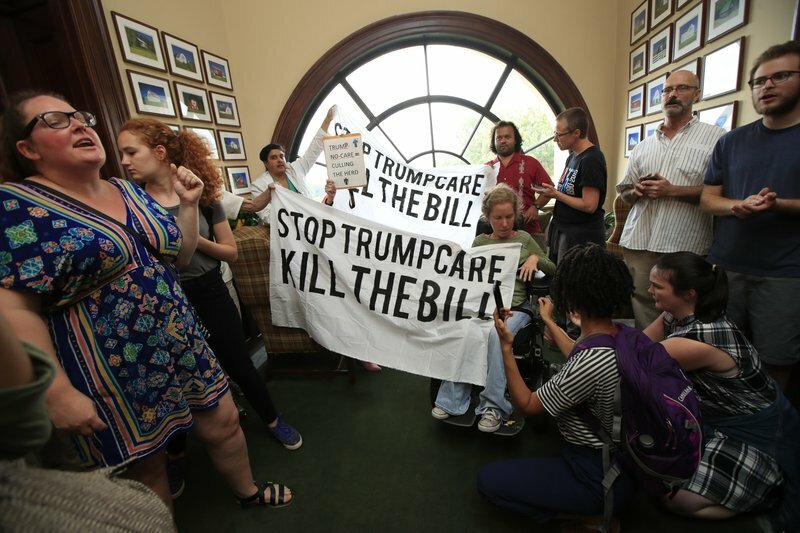 About 150 people tried to squeeze into a community center room and many applauded his opposition to the initial health care bill. The session underscored the evolving position of many Americans to government-run health care, with loud approval for programs such as Medicare and Medicaid.